The following was written concerning the recent union from Abp Andrew, Bishop of the American Diocese of ROAC and is published, as always, in the public interest. If a Bishop or Priest baptize anew anyone that has had a true baptism, or fail to baptize anyone that has been polluted by the impious, let him be deposed, on the ground that he is mocking the Cross and Death of the Lord and for failing to distinguish priests from pseudo­priests. It seems to me that, based on the two above­cited canons, the Apostles had an expectation that the clergy should be able to tell the difference between where the grace of the Mysteries of the Church was present and effectual, and where it was not. But here we are not talking about grace in general. The grace of the Holy Spirit is the life­ creating force at work in all of creation. Everything that has breath breathes by the grace of the Holy Spirit. His grace is everywhere present and fills all things. Everything that is alive lives by the grace of the Holy Spirit. Birds fly by the grace of the Holy Spirit. Grass moves in the wind by the grace of the Holy Spirit. Fish swim by the grace of the Holy Spirit. He takes the grace of His Spirit away and all things return to their dust. Man, being the crown of creation, is certainly not foreign to the action of this grace, Which is at work in the world to draw all things to Itself. So, in a way, it is fair to say that all men have the grace of the Holy Spirit, just like the rain, which falls on all men, or the sunlight, which illumines all men, good and bad alike. the Holy Apostles have laid their hands (or their descendants – the bishops). This grace is not common to all men. When a man leaves the Church, he loses this grace. But he is not grace­less. But rather, he falls back into the category of those who experience the grace which is common to all. This grace again begins to work on him to draw him back to the Church. Scriptures, and they think that what they experience must be the grace of the Church, the grace of the Sacraments. But what they are really experiencing is the grace which moves all men to seek God. It seems to me that in these recent statements made by these synods, there is really nothing new. No one has repudiated Cyprianism. No one has called it a heresy or repented of it. The basic premise of Cyprianism is that the grace of the Church, the grace of the Sacraments, exists in the True Church as well as in the false “church.” The statement made by the Cyprianite Synod seems to me to be rather vague. The GOC, which has condemned Cyprianism on paper, nevertheless practices it, both in Greece, and in the US. This was the case in the past several years, and is still the case. ecumenism, or crypto­ecumenism. This is the essence of Cyprianism. And so, we see another trick of the devil in capturing men’s souls by the error that they think they have eradicated. I have no doubt that they sincerely reject the idea of Cyprianism, but they don’t understand that, although they reject it in word, they continue to practice it in deed. It is unfortunate that Archbishop Andrew is joining the bandwagon of those that wish to malign the unity of the Church. The archbishop speaks of grace as if it is a material, self-subsisting substance, which is possessed as an object by men and things, when in fact it is the eternal activity of the Triune God. Grace is God working and acting. Unless sanctified by the Church, inanimate and non-rational material substances are not grace-filled. Rather, they participate in divine activity only to the extent that they are the result of divine activity. The archbishop seems to have missed two important points made in the Common Ecclesiology: a) that without a correct confession mysteriological unity is impossible (heretics therefore are outside the church by definition), and b) that bishops that preach heresy or commune with heretics are pseudo-bishops (that is, they either forfeit or do not have apostolic succession). Finally, one cannot grant an assurance of validity if there is no validity. The “grave consequence” of heresy is precisely invalidity. Was ROCOR in communion with SiR when the bishops inside Russia were ordained?? No. The Bishops were ordained before the 1994 union; however by 1994 the situation between ROCOR and the FROC had deteriorated. However, at the time — despite Moss’ nebulous implication that Metr Valentine was forced to sign documents (presumably the union documents) from his hospital bed– there was little discussion concerning the SiR until the consecration of Bp Gregory of Colorado, who made it a “pet issue”. Indeed, throughout the early 2000’s Metr Valentine simply referred to the issue as problematic, though many faithful demanded a formal condemnation. Finally In 2007, on the basis of a study of Bishop Andrew (now Abp Andrew as above), Cyprianism-as-heresy was formally condemned by ROAC. Moss said ROCOR was in communion with Romanian Old Calendarists (who were in communion with the SiR) before 1993. To my knowledge ROCOR entered into communion with the Romanians in 1992, though I’ve never seen formal documentation of that. However, they were at least in 1992 loath to “make a choice” between Greek Old Calendarists. The ordination of the Russian Bishops was Bp Varnava- 1988 and Bp Lazarus (RTOC),Bp Benjamin (RTOC) and Bp Valentine (ROAC)- 1990. The 1994 consecrations (which included Bp Agafangel, later of ROCOR-A) led to the separation of the FROC and ROCOR. It is a shame how so little was written down of that period– we got to know fascinating events. When Metr Vitaly was removed, for example– many people thought he would soon “breathe his last” in the Synod building that week. Metr Vitaly wrote his protest– and a visiting Metr Valentine in New Jersey got wind of it, raced down with Fr Vladimir Shishkoff, got Metr Vitaly out and drove him home directly to Canada! Those were indeed chaotic days. Metr Valentine, eternal memory to him, was not always the most theologically reknowned, but one of the most fearless men, let alone Bishops, I ever met. I am grateful to God for that short time. The Theotokos saved him from being beat to death by Russian gangsters. God was watching out for him. I was just reading through this thread, and though I’m commenting quite after the thread’s date, I found the comments very helpful and instructive, with a few exceptions. 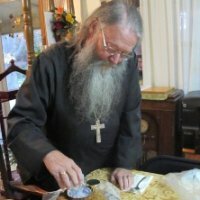 One thing that comes to mind as we pick back through the past (a very helpful exercise if done in a remedial kind of way) is that I, and others, must be sure to remember that there were indeed agents provocateur at work for decades, who had infiltrated the ranks of the Orthodox with malicious intent. Not making excuses, but even hierarchs are human and subject to deceits and subterfuge just like anyone else. That said, I think there are useful models from the past in ‘world “christianity”/”orthodoxy” (a chilling oxymoron, lost on some). As an example, if the SiR (‘union aside’) are still “carriers” (in the medical sense) of their cryptic ecumenism (by way of their ‘ecclesi-illogical’ wordplay) then is it possible that the GOC/K may be “infected” as were those in the ROCOR who capitulated… with the same tragic result? I laud the Autonomous Orthodox Metropolia for their “Open Letter to Traditional Roman Catholics”. THERE is a fertile ground for TRUE Orthodox ecumenical striving.
. True Orthodoxy is the only answer! Yeah. Despite the depositions they leveled against FROC and Met. Valentine, and everything else, Met. Valentine (along with Fr. Vladimir Shishkoff) saved Met. Vitaly from the clutches of 93rd street! And thus, inadvertently helped found ROCiE (and even perhaps the RTOC?!). I can only speak from having known personally someone who was at St. John’s Glorification (though I did kind of confirm what I’m about to say by having seen a video someone took of the festivities) and related the following: Met. Vlasie and Met. Cyprian were both at the Glorification of St. John; they had originally been invited to concelebrate by Archbishop Anthony of San Francisco. While Met. Cyprian was vesting in the Altar, Met. Vitaly walked in, and became extremely upset, and demanded that Met. Cyprian (and Met. Vlasie) take no liturgical part of the ceremonies. In a dinner held after the Glorification, there was a raised daise. At the table Met. Cyprian and Met. Vlasie were invited to set. Met. Vitaly came in, and was again extremely upset at their presence there, he didn’t stay long and left. This does seems to have relevance in that Archbishop Anthony, according to the account, seemed to have no issues with the Romanians (or the SiR Greeks); on the other hand, Met. Vitaly seemed to consistently oppose union with them. He only went along because the Synod was against him on the issue; this coupled with the fact that he no longer had his major allies either in HTM (which had left ROCOR to later form HOCNA), or in the person of the great Bp. Gregory (Grabbe) who was against the union, but, who had fallen out of political favour with Met. Vitaly (even though Bp. Gregory was supposed to have been instrumental in getting Met. Vitaly elected). Met. Vitaly did even repudiate any help offered by the SiR during all the troubles in the midst of his ouster. Met. Vitaly did go along with the ROCiE condemnation of Met. Cyprian’s teaching. That sounds similar to the SiR stand taken on uncondemned heretics. Not to mention Moss says that ROCOR was still in communion with Serbia and Jerusalem in the 90s (they had to commemorate the Jerusalem patriarch or close their monasteries there) and this helped to undermine their mission inside Russia. PLUS, wasn’t Met. Valentine consecrated by Archbishop Anthony of Geneva? ROCOR simply cannot stand under the strictness that many want to hold, yet ROCOR is the foundation on which they desire to stand. Instead of people rejoicing over the GOC-SiR union, they’re undermining it with overly simplistic statements that just don’t hold up under scrutiny. That’s just silly. Your saying that an uncertain statement (“a categorical evaluation in this question can be undertaken only by a properly convened, competent Ecumenical Council, with the obligatory participation of the free Church of Russia”) is more stable (“ROCOR simply cannot stand under the strictness that many want to hold”) than a certain one. The 1974 statement, in fact, virtually killed existing communion with the True Orthodox of Greece, spurred on intense debate between the two sides of ROCOR, including the first hierarch, whose positions on a lack of grace in World Orthodoxy were already well-known, and led to the anathema against ecumenism, which was to avert a break in the Synod over the two sides– which eventually began to unravel with the Free Russian Orthodox Church problems of 1990-94. (Bp Gregory Grabbe, for example, along with some clergy, ceased commemorating ROCOR and commemorating FROC/ROAC altogether). Constant band-aids are not a model of stability. Even the SiR’s figured that out. Whether you are a friend of union or against it, it’s obvious that no part of the former Synod thinks that World Orthodoxy is part of the Church– which was the difficulty of the 1974 statement, but not now. 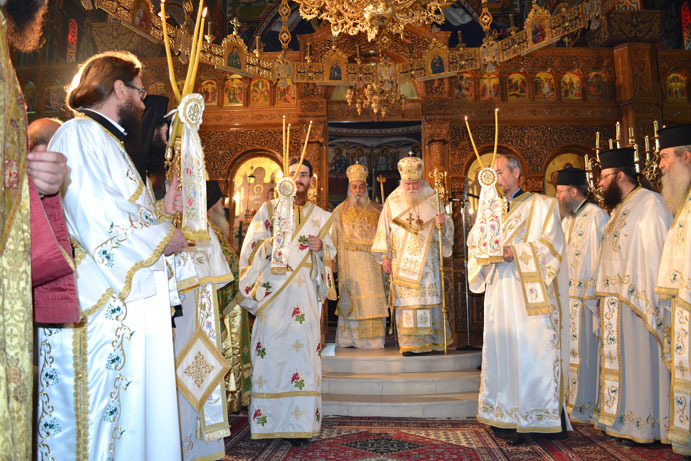 The free part of the Church of Russia is obvious, as well as in Greece, Serbia, Bulgaria, Western Europe, the Americas, Africa– True Orthodox are everywhere, and they are increasingly resolving their differences. Nothing is stopping them from holding council one day– perhaps in response to the coming robber council, if the state churches can actually ever get it together by 2016. (BTW, a false “ecumenical council” is in fact a harbinger of Antichrist in many writings in the Church– although it’d have to crown Antichrist, which the false Council of Florence did not do). I’m sincerely glad that True Orthodox are resolving their differences. I rejoice that there is less enmity in the True Orthodox confession. I also sincerely believe that to depose and anathematize each other and still claim to be one Church is a subtle form of ecumenism anyway (only because I take anathemas and depositions quite seriously). 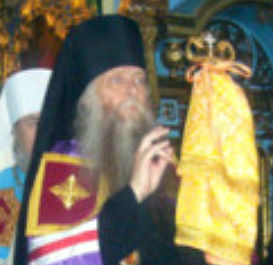 “Throughout the 1970s, under Metropolitan Philaret, there were ongoing secret negotiations, by his explicit blessings, with the OCA with the goal of establishing canonical and eucharistic communion, if not outright union with it (notwithstand the Autocephaly that had been granted to the OCA by the Moscow Patriarchate in 1970). Metropolitan Philaret, in 1973, sent me to meet with Protopresbyter Alexander Schmemann to discuss possible ways such a rapprochement could be accomplished. Secret meetings were held between Protopresbyter George Grabbe and Protopresbyter Alexander Schmemann at the Commodore Hotel in NYC…I was a member of this Commission, so I have first-hand knowledge of it…This information has been quite closely held over the past decades, but recently, the Memoirs of Fr. Alexander Schmemann were published in English, and just now, his Diaries have been published (in Russian). What’s the purpose of me stating all this? 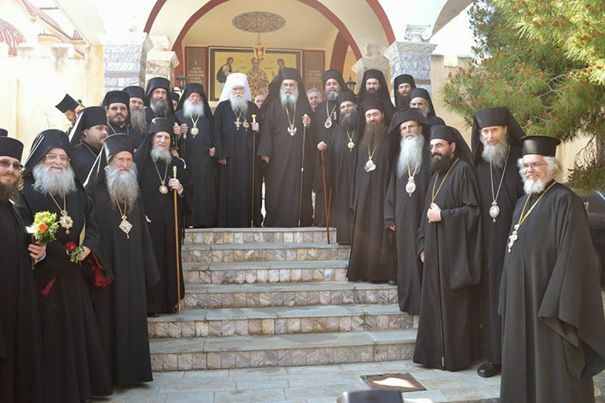 Not to deliberate about World Orthodox being in the Church in 2014. If that’s how GOC-K feels then they should come right out and say it, anathematize Cyprianism and the World Orthodox. This GOC has done it before, so it needs to be done again because people seem to be confused as of yet. My point is that I question how Abp. Andrew can be so judgmental of SiR and this union when Met. Valentine was ordained by Abp. Anthony of Geneva, an ecumenist bishop in a church that was in some form of communion with World Orthodoxy. ROCOR of the past, the very foundation of his synod, could not stand up to the same scrutiny he’s utilizing to judge the GOC-K.
One note, however: the 1974 statement also severely damaged relations with the Florinites. The RTOC was in communion with the Cyprianites for years, even after the ROCOR broke communion with the Cypriantes. Yet, in regular “TOC” contradiction and hypocrisy, Moss recognizes the RTOC. I think he rightly points the problem of parapraph VI of the ecclosiological agreement, that might create unity on bad bases. For now, this paragraph being problematic, as I explain in my open letter, I ask everybody to put some pressure on the bishops to get a clear and official clarification, and until such clarification is provided, reject the ecclesiological document in its current wording: http://orthodoxie-libre.over-blog.com/article-a-union-with-many-questions-123067866.html Those agreeing are invited to spread the word. For now, condemnation for semi-cyprianism are prematurate because the “accused people” are allowed to have their say. The document published by SiR in regards to this recent unity was worded in a very pro-Orthodox manner. Reading it one would think, “Great! They’ve returned to the Faith”. But nowhere has there been a joint or separate clear and directly repudiation of “Cyprianism” as a heresy. Without such clear anathematizing “Cyprianism” we know not how pure or impure this union really is. Benedicite! If they have dropped the position that heretics can comprise part of the Church, what more is there really? Isn’t that the essence of “Cyprianism” as condemned anyway? 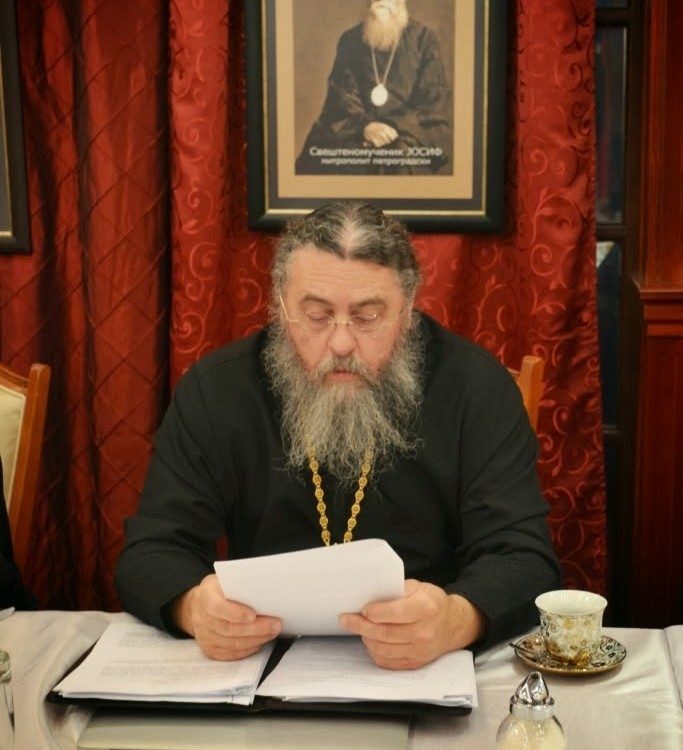 I agree with Archbishop Andrew of Pavlovskoye and Rockland in that a specific denial of, an anathema of, “Cyprianism” is needed. When one converts from one of the form of Protestantism or another the convert must clearly state they henceforth deny their past affiliations during their exorcism. Same should be here with SiR/GOCs. No? Forgive me an unworthy servant. Met. Valentine was convicted of pedophilia in 2003. All, or most of “TOC” bishops are corrupt, of bad will, and unethical power-mongers. It is a grave sin to falsely slander bishops of the Church. For your information, Metropolitan Valentine was accused and brought to court in Russia over a false accusation of molesting a boy in Russia. He wasn’t even in Russia when this was supposed to happen, and the boy himself admitted that he was put up to it by bribery by a certain man who hated Metropolitan Valentine. The case was thrown out and Metroploitan Valentine was acquitted. ROCOR at the time acquitted him too. Quit slandering people! You have mental problems! Andrei is another phony of bad will.